Inspired by the skin of a pine cone, the triangulated diagrid façade responds to the environment like a living organism. Breathing life to the streetscape, the spiky windows contain 6290 glass panels that dazzle in the sun. 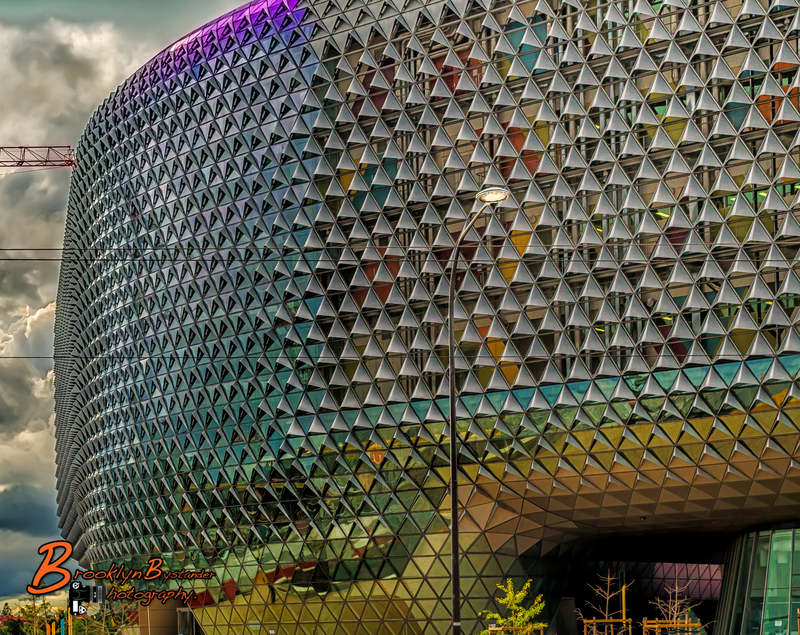 This entry was posted in Photography and tagged Adelaide, architecture, colour, colour FX, Health and Medical Research Institute, Lightroom, Medical Research Institute, Photography, SAHMRI, South Australia. Bookmark the permalink. What an amazing building! Great photos too, love the one of the archway. I can imagine you’ll be back for more! Wow so is the underneath ! !!! no seriousley I do have some more and will post prop tomorrow or the next day. You too Mike, I wanted more ! I love the rainbow effects on the glass 🙂 Now I can’t decide if I like the B&W or colour images best!